This was the Friday evening gala dinner at Antonio Galloni Vinous Media's La Festa del Barolo 2015. I sat with members of my regular Barolo group at the G.B. Burlotto table with Fabio Alessandria who is the winemaker at Burlotto and the great-great-grandson of Commendatore Giovan Battista Burlotto himself. The G.B. Burlotto Winery was founded in 1850. I attended another dinner with Fabio in 2012. You can find my notes and photos for that dinner here. Part 2 of La Festa del Barolo was a Morning Tasting of the New Release of 2010 Barolos the next day. My notes and photos for the Gala Dinner at the 2013 La Festa del Barolo and the 2011 La Festa del Barolo. The Reception and the Venue. Other Tables and Their Wines. The Four Seasons Restaurant is a special and historic restaurant. The food at dinner was truly outstanding. Kudos to Executive Chef Pecko Zantilaveevan. The lobby by the entrance at street level. Upstairs: The bar in the Grill Room. 2004 Dom Pérignon in magnum and 750. NV Bérèche Brut Rosé Campania Remensis. With tasty assorted appetizers in the Grill Room before dinner. Both excellent but no notes. Dinner in the Pool Room. Note before clicking on this, the original is a 10MB file. Greg arrives at our table and is greeted by Kelly. Bettina Rogosky of Il Carnasciale and Kelly. Antonio Galloni gets the evening started. Unlike the first two La Festa Gala dinners, our table was assigned three sommeliers who laid out a plan for the wines we brought to pair with the various courses, so the wines didn't just keep coming, but came out in flights with the food. Our three sommeliers were among the best in the business: Paul Grieco of Hearth Restaurant and Terroir Wine Bars, Levi Dalton of I'll Drink To That! and so you want to be a sommelier?, and Jarred Roth from Riverpark. Grilled Octopus with Blood Oranges, Capers, Chickpea Puree, and Romesco Sauce. A 3.78 liter bottle brought by Eddie M. Decanted before dinner. Nose of earth and cherries. Long elegant and earthy. Bettina brought olive oil from her estate. It was exquisite. The waiter offered a taste of the olive oil used at The Four Seasons. Fabio and his East Coast importer/distributor Filippo Pistone of Bacchanal Wines. Henry thinks Greg is nuts. He's right! Wild Mushroom Risotto with Foie Gras. As Todd said, "I could have eaten 4 courses of this. Just a great dish and perfect with these wines. My heart belongs to Foie Gras! Earthy nose. On the palate, the wine is dirty and lacks fruit. Maybe just a bad bottle? Henry brought this and was not happy that it had to follow the 1958 Bartolo, but boy did it hold its own. A stunningly complex nose. Delicious, complex and elegant in the mouth. Wow! Marzia chats with Kelly and Greg. Four Season Short Ribs with Roasted Root Vegetables. Excellent! Muted nose. Earthy, tannic. Not much here. Sommelier Jarred Roth from Riverpark (left). Jonathan D (right). Michael Jessen of Wally's Auction and Antonio begin the charity auction. $228K was raised to support The Zone at Mount Sinai Hospital. Greg, Henry, and Todd are enjoying themselves. 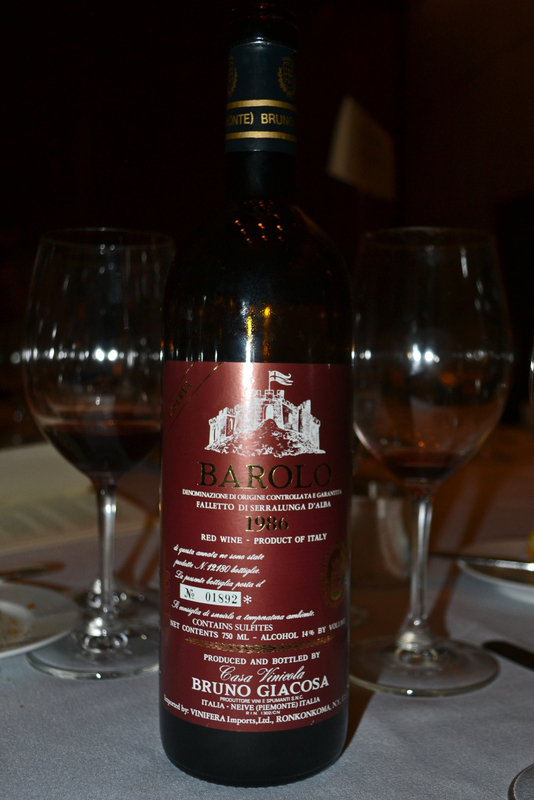 Josh L brings a bottle of 1958 Cappellano Barolo by for us to taste. 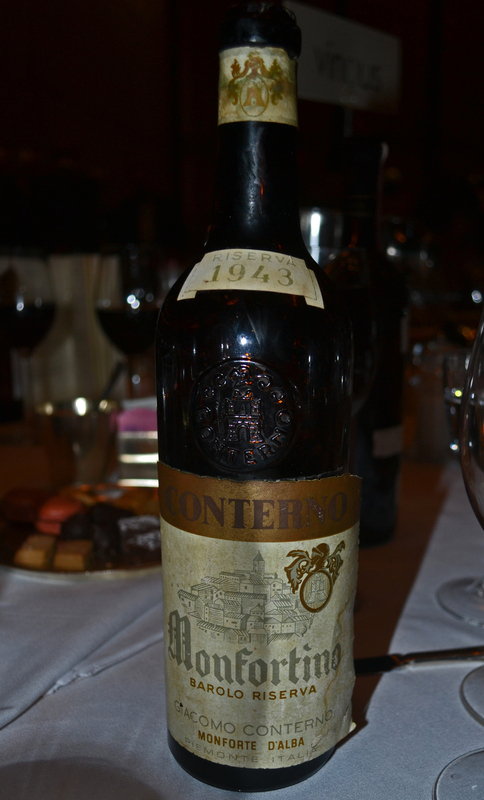 Josh's bottle of 1958 Cappellano Barolo. Antonio stops by to say hello to Bettina. And to hang with the old gang for a bit. Magnum brought by Todd. Hard to judge. Seems out of place in this sequence. Not rated. I think I would have liked it quite a bit earlier. Sour and medicinal. Not sure where this came from. Not rated. From a magnum that I never saw. Gorgeous youthful nose, but the palate is a letdown. Dried out. Not rated. Tough going after the Giacosa Riservas. Luca Currado comes by for a visit. Bettina, Kelly, Fabio, and Mannie Berk of Rare Wine Co.
Then, just when I thought I was done, Antonio shows up at our table with freshly opened bottles of these 2010 Barolos from Giuseppe Rinaldi. Wow! What a way to finish the evening. So much of the past tonight, now a glimpse into the future with these two great young wines. The Ceretto table. Alessandro Ceretto with the glasses on the left. Chris W, Meridith W, Josh L, Kathi R, and Ben G.
The Ceretto table. Meridith W, Josh L, Kathi R, Ben G, Sandi M.
The G. Conterno table. Roberto Conterno seated far left. Eric Guido at the Elvio Cogno table. Valter Fissore seated next to Eric. Silvia Altare at the next table in the back left. The G.D. Vajra table. Giuseppe Vaira facing away. His father Aldo facing. Wines from the Cogno table held by Nadia Cogno & Valter Fissore. 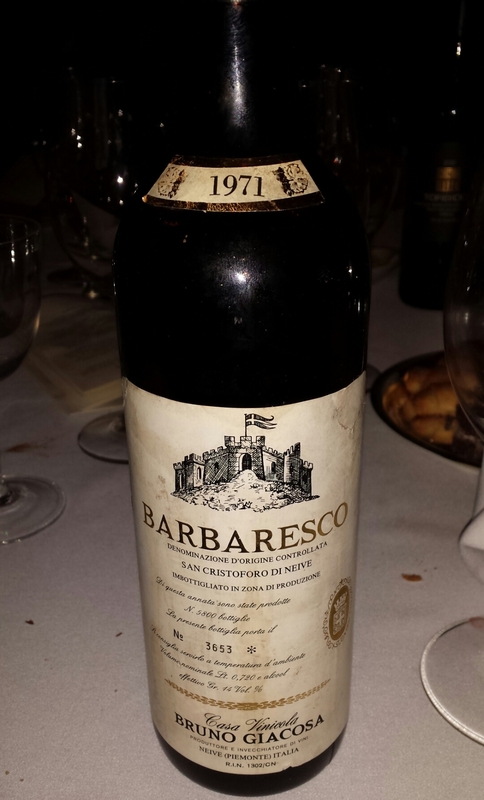 The gold label wines were made by Nadia's father Elvio Cogno. More of the wines from the Cogno table. Just some interesting bottles found on other tables. Eric Guido's notes on this evening.